Everyone who is trying to lose weight looks for dietary changes and supplements that may help them achieve their goals. Apple cider vinegar has become popular among people who are trying to lose weight. It is a natural preparation that is inexpensive and easy to find. Taking a small amount of vinegar in the morning is reported to help the body manage blood sugar more efficiently and make you feel full longer after meals. We have examined the benefits and side effects of apple cider vinegar for weight loss so you can make an educated decision about this possible weight-loss aid. Apple cider vinegar, or ACV, is made from fermented apple juice. When yeast is added to the juice, it ferments into alcohol. Bacteria consume the alcohol and turn it into acetic acid. Acetic acid, a short-chain fatty acid, dissolves into hydrogen and acetate when it is digested. ACV is sold in distilled varieties and in unfiltered varieties where the natural beneficial bacteria remain. Reportedly, consuming ACV with the beneficial bacteria gives more of a weight-loss effect. Fermented foods like apple cider vinegar can be beneficial because they support the growth of good bacteria in the gut. Healthy gut bacteria has been linked to lower weight and overall good health. Acetic acid has some documented health effects, though the studies are small and many have been done on animals. Scientists are still working to discover all of the benefits of ACV. A Japanese study from 2009 found that acetic acid contributed to a greater weight loss than a placebo. The study was divided into three groups: people who took 1 tablespoon of vinegar (15 mL) and those who took 2 tablespoons (30 mL), as well as a placebo group who was not given any vinegar. Study subjects were told to cut down on alcohol but to otherwise live their lives as usual. After 12 weeks, the study participants who took the vinegar experienced weight loss benefits. They had lower body weight, waist circumference, and BMI. The vinegar users also had lower blood serum triglyceride levels. The Japanese study concluded that vinegar brought significant weight loss benefits to the participants. Obese diabetic rats were found to have improved outcomes when taking acetic acid. It reduced liver fat and belly fat storage. Acetate, the compound found in the body when acetic acid breaks down, may also have a positive effect on appetite control. Another study found that the acetic acid in vinegar helped people with Type 2 Diabetes to improve their insulin and blood sugar levels. A study in rats found that acetic acid lowered blood sugar levels by encouraging the liver to remove sugar from the blood. The same study found that the rats’ ratio of glucagon to insulin was improved, resulting in better diabetes control and more fat burned. A human study found that apple cider vinegar for weight loss lessened blood sugar response after eating a high-carbohydrate meal. The same study noted that participants’ stomachs emptied more slowly, causing a long-lasting feeling of fullness. Insulin and blood sugar were also lowered. When taking ACV, it is best to dilute it in a glass of water. It is best not to take ACV before exercising since it can cause heartburn and reflux. Since ACV is highly acidic, it can cause damage to the teeth. Always rinse your mouth thoroughly and brush your teeth after taking ACV. There are many easy ways to work apple cider vinegar into your diet. Most people choose to dilute it in a glass of water and to have it in the morning as part of their routine. One of the simplest ways to add the vinegar to your diet is to make vinaigrette salad dressings using the ACV. You may find that adding apple cider vinegar to your diet helps you to control your weight. You may find that your appetite is lessened, making you want to eat less. Taking advantage of acetic acids’ many health benefits is smart for anyone who is looking for a simple, all-natural way to lose weight. It’s worth bearing in mind that the studies cited in this article have been relatively small. Still, they point to encouraging results for the use of apple cider vinegar for weight loss. It is a preparation with few risks and possibly great benefits. 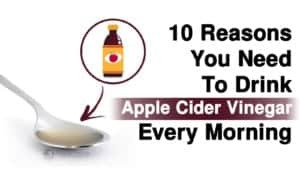 Try ACV as part of your morning routine or work it into your diet. You may be pleased and surprised by the results.